I am blown away by this stunning music video by Nigel Stanford which uses genuine experiments to make visible the inherent geometries within sound and music. The video demonstrates a process called ‘cymatics’, which is the science of making audio frequencies visible. I am always in awe of the mysterious and enigmatic patterns formed, which show the intricate geometry of nature. 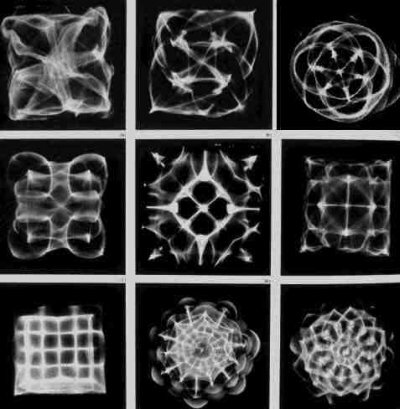 The word ‘cymatics’ originates from a Greek word, meaning wave, and since sound is a waveform, cymatics allows you to visually interpret sound. Different patterns emerge in the medium depending on the frequency of the sound omitted. I am fascinated by the exceptionally beautiful and complex geometric designs that express the structure sound. They remind us of the profound symmetries found throughout the natural world, from the unique geometry of a snowflake to the orbital pattern of the planet Venus, known as the Rose of Venus. The circular, geometric forms created can be seen as mandalas in their own right. In fact, everywhere you look in nature, these structures are visible, from the sunflower head to the nautucas shell and the humble pinecone. Be warned….once you notice this phenomena, no walk in nature will ever be the same again! http://NigelStanford.com/Solar_Echoes From the album ‘Solar Echoes’. There is order within what seems at times chaos.